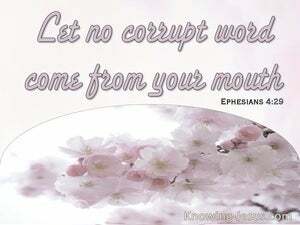 ﻿ Ephesians 4:29 Let no corrupt word proceed out of your mouth, but that which is good for edification, that it may minister grace unto the hearers. Let no corrupt word proceed out of your mouth, but that which is good for edification, that it may minister grace unto the hearers. No rotten talk should come from your mouth, but only what is good for the building up of someone in need, in order to give grace to those who hear. Let no corrupt speech go out of your mouth, rather if there is any good word for edification of a need, so that it may give grace to those who hear. Let no foul or polluting language, nor evil word nor unwholesome or worthless talk [ever] come out of your mouth, but only such [speech] as is good and beneficial to the spiritual progress of others, as is fitting to the need and the occasion, that it may be a blessing and give grace (God's favor) to those who hear it. Do not allow unwholesome [Note: The Greek word for "unwholesome" is "rotten, diseased"] language to come from your mouth, but only what is helpful for building up those who need it, so that you can impart favor [i.e., benefit] to those who listen [to you]. Let no unwholesome talk come out of your mouths, but only such as is good for building others up according to the need of the moment, that it may impart grace to those who hear. let no obscene language defile your mouth, use only such as tends to edification, that it may be beneficial to the hearers. Let no corrupt word go out of your mouth, but if there be any good one for needful edification, that it may give grace to those that hear it. Let no corrupt communication go forth out of your mouth, but if anything is good unto edification of need, in order that he may give grace to those who hear. No bad word must ever pass your lips, but only words that are good and suited to improve the occasion, so that they will be a blessing to those who hear them. Let no corrupt discourse proceed out of your mouth, but that which is good, to the use of edifying, that it may minister grace to the hearers. Let not any foul word go out of your mouth, but if any good to the building of necessity, that it might give grace to them hearing. Let no filthy communication proceed out of your mouths: but that which is good to edify withal, when need is, that it may have favour with the hearers. Let no bad word pass your lips, but only such speech as is good for edification, as occasion may require, words that are gracious and a means of grace to those who hear them. From your lips let no evil words come forth, but such as occasion warrants, such as are good for upbuilding and give a blessing to the hearers. Let no evil word proceed out of your mouth, but that which is good for useful edification, that it may afford benefit to those that hear. Let no loose discourse proceed out of your mouth, but whatever is good for useful edification, that it may communicate grace to the hearers. Never let any foul word pass your lips, but only such good words as the occasion demands, that they may be a help to those who hear them. Let no unwholesome words ever pass your lips, but let all your words be good for benefiting others according to the need of the moment, so that they may be a means of blessing to the hearers. You must stop letting any bad word pass your lips, but only words that are good for building up as the occasion demands, so that they will result in spiritual blessing to the hearers. Let no corrupt speech proceed out of your mouth, but whatever is good for the supplying of the need, that it may give grace to those who hear. 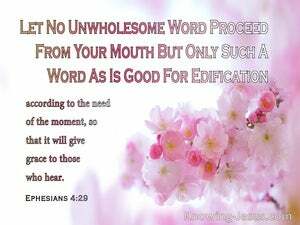 Let no corrupt word come out of your mouth; but what is good to useful edification, that it may benefit the hearers. 28 Let him that stole steal no more, but rather let him labour, working with his hands that which is good, that he may have to give to him that is in need. 29 Let no corrupt word proceed out of your mouth, but that which is good for edification, that it may minister grace unto the hearers. 30 And do not grieve the Holy Spirit of God with which ye are sealed for the day of redemption. Let your word be always with grace, seasoned with salt, that ye may know how ye ought to answer each one. The tongue of the wise shall adorn wisdom, but the mouth of fools shall speak foolishness. Pe The mouth of the righteous speaks wisdom, and his tongue brings forth judgment. The lips of the wise disperse wisdom, but the heart of the foolish does not so. The wise in heart is called a man of understanding; and the sweetness of the lips shall increase doctrine. The words from the mouth of the wise man are grace, but the lips of the fool will swallow up himself. O generation of vipers, how can ye, being evil, speak good things? For out of the abundance of the heart the mouth speaks. yet in the congregation I would rather speak five words with my understanding, that I might teach others also, than ten thousand words in an unknown tongue. From whom the whole body fitly joined together and well tied together among itself by the nourishment that every connecting bond supplies, by the operation of each member according to measure they have received, making increase of the body unto the edifying of itself in charity. But now put ye also off all these things: anger, wrath, malice, blasphemy, filthy communication out of your mouth. Let the word of the Christ dwell in you in abundance in all wisdom, teaching you and exhorting you one to another with psalms and hymns and spiritual songs, with grace singing in your hearts unto the Lord. Therefore comfort and edify one another, even as ye do. For we all offend in many things. If any man offends not in word, the same is a perfect man, and able also to govern the whole body with restraint. Thou art fairer than the sons of men, grace is poured into thy lips; therefore God has blessed thee for ever. In the same manner my tongue shall talk of thy righteousness every day, for they are confounded, for they are brought unto shame, that seek my hurt. Their eyes stand out with fatness; they easily obtain the desires of their heart. We will not hide them from their sons, showing to the generation to come the praises of the LORD and his strength and his wonderful works that he has done. Then those that feared the LORD spoke one to another, and the LORD hearkened and heard it, and a book of remembrance was written before him for those that feared the LORD and for those that think in his name.